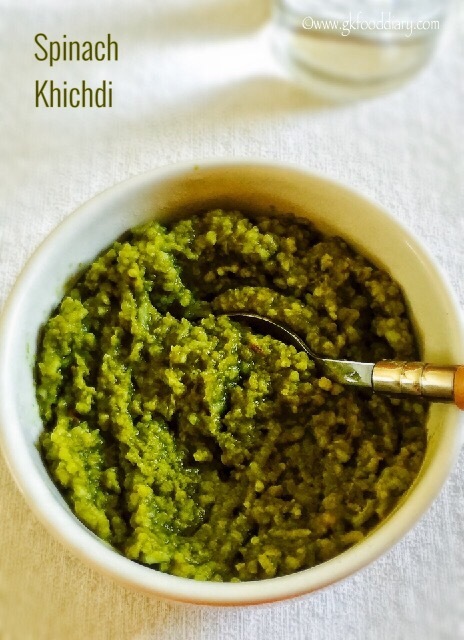 Spinach Dal Khichdi - A quick, comforting meal made with rice, lentils, and spinach. Nutritious and iron food for kids. Slice onions chopped ginger and garlic finely. Wash and roughly chop spinach into bite-size pieces. Slit green chilies. Set aside. Wash rice and toor dal together and soak it in warm water for 20 minutes. In ½ tsp of ghee, fry the spinach and green chili together until it shrinks. Switch off the flame once done. Grind spinach and green chili together to a fine paste. Set aside. Heat a pressure cooker with ghee. Add cumin seeds. Let it crackle. Then add onions and chopped ginger and garlic. Saute them nicely until golden brown. Once onions become transparent, Add spinach puree, turmeric powder, pepper powder, garam masala powder(if using) and required salt. Give a quick stir. Then add soaked rice & toor dal mix well. Give a quick stir. Add required water and bring it to a boil. Then close the lid of pressure cooker and cook everything in a medium flame for three to four whistles. Once the pressure releases, open the cooker, add lemon juice and fluff the rice with a spoon slowly, top with ghee if required.